Privacy of Internet users is dead somewhere as the Intelligence agencies can watch our every move, hear our every conversation and read our every email and find out anything related to our personal and private life. Last year, Edward Snowden revealed about the mass surveillance carried out by NSA and other countries intelligence agencies on every citizen of their country. The US Government has allotted a large share of its 'Black Budget' for secret surveillance programs and to make this happen, NSA has used a number of unethical ways and labelled as legal solutions, harvesting hundreds of millions of Metadata from emails, web activity, chats, social networks, and everything else around the world. The revelations encouraged Internet users think about their privacy and digital rights, and the time came when different organisations started several campaigns to block mass surveillance and fight back against the U.S. National Security Agency (NSA). A wider coalition of more than hundreds of Internet companies and civil liberties, environmental and political organizations is arriving together with a global call to “Reset the Net” that aimed to beat government and corporate surveillance on the web making mass Internet surveillance more difficult for the NSA and other spy agencies and governments. The campaign is similar to 'The Black-Out Day', the largest online protest in the history of the Internet, successfully carried out by Google, Wikipedia, Wordpress and many other companies to protest two federal bills, the Senate’s Protect IP Act and the House’s Stop Online Piracy Act (SOPA). Thousands of websites went dark over the internet to stop mass surveillance conducted by the government. But later the US government molded its Foreign Intelligence Surveillance Act in such a way that, now it legally allowed them to monitor Billions of calls in a day and tracking a million of the devices, and this is what we cannot allow them to make happen. 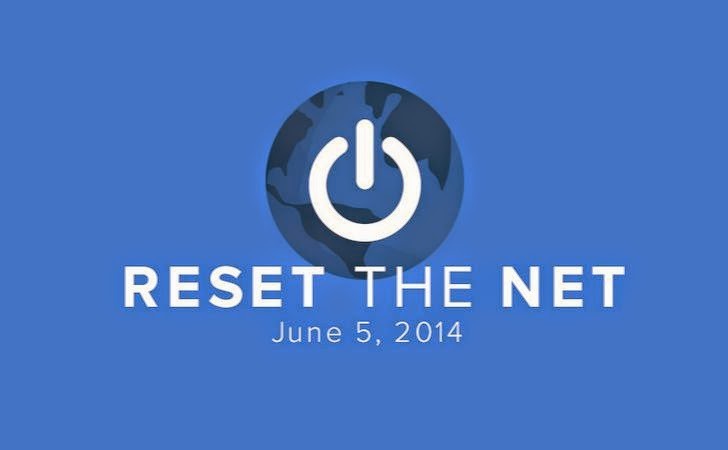 The new campaign is organized by Fight for the Future, which is planning a day to "Reset the Net" by deploying new privacy tools and enhanced security measures on June 5, exactly a year after the first Edward Snowden revelation regarding the NSA’s PRISM program, based on documents the former NSA contractor provided to the media. The coalition includes Web sites such as Reddit, Boing Boing, Imgur, DuckDuckGo, the Free Software Foundation, CREDO Mobile, along with a number of organizations like the Freedom of the Press Foundation, Demand Progress, the Open Technology Institute, the Libertarian Party. "The NSA is exploiting weak links in Internet security to spy on the entire world, twisting the Internet we love into something it was never meant to be: a panopticon," they say. "We can't stop targeted attacks, but we *can* stop mass surveillance, by building proven security into the everyday Internet." The groups are encouraging developers to add at least one NSA resistant feature to mobile apps and Internet users to use privacy and security tools such as a secure version of HTTP i.e. HTTPS, HTTP Strict Transport Security (HSTS), a Web security policy tool, and Perfect Forward Secrecy (PFS) which is a public key cryptography tool to better secure the communication of Internet users and fail government intelligence agencies’ man-in-the-middle attacks. The Government and NSA always defended their mass surveillance program as a part of the legal action, by saying that it is necessary and only carried out to target terrorists and related crimes just to protect the security of the nation. But we, sitting over here, are not fool to differentiate between the ‘security of the nation’ and ‘security of our privacy’. One has no right to risk other’s security to protect one’s own. So, will you all, who are reading this article right now, go back and sit relax? You should not. Go and protect your privacy and digital rights, and Join the campaign. We will not remain quiet now. Enough is Enough.